1936 UTICA FOLDING KNIFE. Utica, Featherweight, PAT. APL.33” on the tang. This is in very good, not excellent condition and could use cleaning. However, the blades open and close nicely with. the half-stop in working condition on all the blades. This is the Kutmaster Knife first listed in this smaller version in the 1954 Girl Scout Catalog. They still shine, but need cleaning. You can see there is use on the master blade which has been sharpened. The catalog describes it as". girl scouts is beautifully etched on the Master Blade, along with the blossom trefoil and 1912 - 2012.". The other three blades are a Can Opener, a Punch or Awl, and a Bottle Opener. Made by Kutmaster. Official Girl Scout Knife. Circa 1960's. Brass Bolsters. Ready to use! Cleaned and Sharpened. This is a lovely Remington 4-blade folding knife, with a rare LONG PULL on the master blade. The Remington hallmark is on the tang stating, "Made in USA, Remington UMC.". You can clearly see the "GIRL" still etched which indicates little use and almost no sharpening. This is a RARE Remington 2-blade folding knife. The Remington hallmark is on the tang stating, "Made in USA, Remington UMC.". On the reverse of the tang is, "R4723.". The Girl Scout trefoil shield is worn indicating long wear. 1931 ULSTER, DWIGHT DIVINE & SONS. 4 blades: Master Blade w/Full Girl Scout etch and old EAGLE logo. Closes correctly with half-stop; looks to be about 98%. Beautiful LONG PULL. Also, one-piece can opener, bottle opener and awl, all unused. As early as 1918, the Girl Scout catalog shows this hook that slides onto the old Khaki belt. From the hook a Girl Scout could hang her knife, whistle, compass, etc. This particular style was available for many years, and also shows on the GREEN webbed belt from 1928. It is in good condition. probably from around 1960-1970. I believe this to be the Utica Knife listed in the 1932 Girl Scout Catalog. It is described as, ". mottled green, Mother of Pearl Handle. with silver Eagle Logo shield.". It has a beautiful "long pull" on the master blade and the tang says, "Utica, Featherweight, Pat. This is the FIRST EVER KNIFE ISSUED SPECIFICALLY FOR BROWNIE GIRL SCOUTS. This is also the ONLY Brownie knife with a SAFETY LOCK. I've pointed it out with a red arrow. It works perfectly. These little single blade knives did not hold up well, and you can see the problems. Looking at knives in the GS catalogs is very confusing. For example, in 1919 it simply says: Knife 1 or Knife 2. Here is that knife! No maker is listed nor are the blades defined. On the back side of the master blade it says, "Y 501.". In 1985, Girl Scouts changed from a red vinyl case to this clear plastic front and Blue back. The case and the knife show the New 3-Profiles Logo. As is typical from the past, only the knife has the logo and the maker. All the blades are just a little bit smaller. Master has a short pull, tang says, "Kutmaster, Utica, N.Y. made in U.S.A." Includes a plain awl, bottle opener, and a can opener that says, "Can Opener.". 1973 KUTMASTER UTICA. This is the 4-blade folding knife shown in the 1973 Girl Scout Catalog. It is described as, ". dark green jigged handle. high carbon steel blades w/unbreakable handle. " On the master blade the tang says, "Kutmaster Utica, N.Y. U.S.A." You can see that there is no use on the knife, and the master blade shows 100%. This is the Utica Knife listed in the 1954 Girl Scout Catalog. You can see there is no use on the knife especially the master blade which is 100% full. The blades open without any wobble and close nicely with a half stop, although the master blade closes a little slowly. Look at this beautiful compass! It is unused and MINT Condition in the ORIGINAL GIRL SCOUT BOX. You can see the little green book of instructions which is unread and untouched. I took the compass out to take the pictures. This is an Imperial Knife first listed the 1995 Girl Scout Catalog. It is described as, ". blue plastic Delrin handle. The hallmark on the master tang is, "Imperial, PROV. 1995 IMPERIAL. 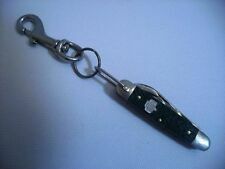 4-BLADE JACK KNIFE. Looking at knives in the GS catalogs is very confusing. For example, in 1919, in simply says, Knife 1 or Knife 2. Until the last ten years or so, the maker was NEVER listed in the catalogs. This knife has the maker on two of the tangs. This is the Kutmaster/Utica Knife listed in the 1981 Girl Scout Catalog. It is described as, ". Textured Delrin plastic handle. new profiles logo embossed on both sides." The master blade tang says, "Kutmaster Utica N.Y., U.S.A., R-8.". 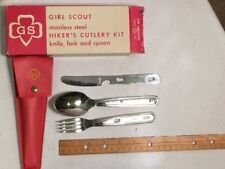 This FULL SIZE Utensil Kit with a RED VINYL CASE was first issued for the Girl Scouts in the late 1950s, (when all the leather cases were changed to vinyl.). The knife is also inscribed, "Imperial, Stainless, U.S.A." The Fork and Spoon are inscribed "Stainless U.S.A." The Utensils are in Excellent, very slightly Used Condition without any rust or serious marks. So if the 75th Anniversary was important to you, here is a treasure to remind you of it. It can be used as a hot-plate or hung on the wall by the hook that is built into the back as you can see in the picture. This lovely knife was available for only a few years and was replaced with the 100th anniversary knife in 2011. So it is rare for two reasons. 1. because it had such a short run, and 2. because it is the ONLY Girl Scout knife with a round emblem instead of the trefoil emblem. Made by Kutmaster Utica New York. Mint green lucite handle. Knife handle, can opener, punch, bottle cap, screwdriver. 3 ⅜ closed. Master 2 7/16" spear point blade Tang is stamped; " UTICA FEATHERWEIGHT PAT APL ". It is not included in this sale! It is in very good condition, It has Terri etched on the sliver. The blades need cleaned up. It has the Girl Scout Tri-Face Logo on a Mint Green Lucite Handle. It has 2-Nickel Bolsters that are nice and tight and 4 blades. For your consideration is this Girl Scout knife, fork, and spoon set by Boker. It is in excellent condition. The knife closes with a strong snap and has a smooth arc. Make sure to view pictures carefully, so there is no mis-understanding of what you are receiving. I cannot help if not given the opportunity to! Studio Black Antiques. We're here to help make your buying experience the best possible. It's The Studio Black Difference.